"The engineering team offers a range of support to the entire franchise network. We have technical phone support, to fix faults when the franchisee is on site. We have field engineers who are available to attend sites, from fault fixing, to relocations or even machine servicing/refilling." Steve has been part of the Uvenco/Snack in the Box team for over 10 years. He has been in a variety of roles, focusing on the machinery and the technical side of the business. 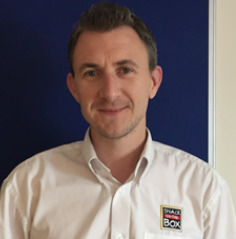 His main role within Snack in the Box is to provide the network with parts and technical support in a variety of ways, achieved with his team of field engineers and the support of the franchise managers. We asked Steve to discuss what engineering support we offer to new and existing franchisees. Machine breakdowns are something that all franchisees will encounter through their time servicing vending equipment. Like all electrical items and appliances with moving parts malfunctions can occur at any point for a variety of reasons. The common question is ‘how often will my machines break down?’ but this is almost impossible to answer. There are ways in which we can advise franchisee’s to minimise the risk of breakdowns. We want to provide as much support as possible to minimise the impact of breakdowns. Franchisee’s may have the odd breakdown or minor issue to resolve through the course of the week. Then they may not have an issue for a few weeks but then suddenly have 3 issues all at once. Either way SITB will be on hand to assist in resolving these issues. The first person to attend site once a breakdown is reported is the franchisee as they are the ones in the area, and visit the machines on a frequent basis. We hope that the franchisee will be able to do most fixes quickly and with ease in this initial visit. We don’t restrict where franchisees locate their equipment. In fact we encourage them to look for opportunities to develop their business and optimise sales. Often the quickest way to act on these opportunities is utilising machinery within their area, which they deem to be under performing. Uplifting from site A and deliver to site B. Again we are on hand to offer guidance, advice and physical support via the engineering team, whenever required. The engineering team offers a range of support to the entire franchise network. We have technical phone support, providing diagnosis and guidance to fix faults when the franchisee is on site and attending a machine. We have field engineers who are available to attend sites where requested. They can carry out whatever work that specific franchisee wishes, from fault fixing, to relocations or even machine servicing/refilling. The technical department also seeks to provide parts at the best possible value to the franchise network and in the majority of cases offering next day delivery when parts are ordered. All franchisees entering the business are given an ‘in house’ training day at one of our regional offices. A range of machines are stripped down and rebuilt providing a hands on technical experience. These foundations should give confidence and illustration that even the less technically minded can carry out the required routine servicing and first time fixes they are likely to encounter. We are also able to provide refresher training either out in the field or again at one of our offices to build on the knowledge already gained or to address specific requirements. Our engineers when carrying out repairs in a given area can always be joined by the local franchisee to gain more experience. Also when first handing the business over a SITB representative will be present to offer additional support and training on each of the machines visited. Incoming franchisees are provided with a part pack tailored to the package they are buying. This will include motors, panels, and machine components, as well as a tool kit, product decals and labels to enable the franchisee to start off on a steady footing. In the first year of business all franchisee’s vending machine parts are covered by a 12 month warranty. This ensures during this period the franchisee is able to focus on the servicing of equipment, settle into a stable routine and learn the industry without the concern of parts ordering and maintenance issues. By the end of year one the aim is to have a stable business with fully functioning machinery ready for the business to grow in the coming years. With the training and support offered by SITB we are confident that on the whole there is no fault we cannot rectify on site. Whether that is by the franchisee or engineering team. In the rare instance where we deem it best to remove a machine from site in order to carry out repairs, working with the franchisee we offer a range of options to minimise the impact on the specific site and the franchisee. This could be in the provision of a temporary replacement or a more permanent machine replacement.